Ever since Monday when my friend called to tell me her cancer may have recurred, I’ve been overdosing on chocolate. Since it was almost Valentine’s Day, I had bought a big bag of dark chocolate chips and a couple of pints of strawberries. My love and I planned to dip our strawberries in the delicious chocolate and sip champagne last night to celebrate Valentine’s. But here’s what actually happened: On Monday, after D called with the information that could be “real” or “fake” news, I decided, against my better judgment, to open that big bag of chips while I was cooking dinner. Our niece and nephew were coming for dinner, so I was spending a little more time in the kitchen than usual and was enjoying listening to music. But chocolate would make it even more enjoyable and those darned chocolate chips kept calling my name. I swear to you they said “Hannah, eat us and you’ll feel better!” Such liars those chips are! I ate a few and I didn’t feel better. So I ate a few more and a few more. You get the picture. Well, I kept telling myself, at least the homemade tomato soup I was making didn’t have cream in it. That meant I could eat MORE chocolate. Ha! And, I wouldn’t even make myself feel guilty about it because my best friend’s cancer might have recurred. Sometimes you just have to giver yourself permission to pull the “C” card, even with yourself! When Valentine’s Day came, J and I decided to split a gluten-free cupcake with our champagne instead of eating the strawberries dipped in chocolate. At the end of the evening, I asked my husband to please dispose of the chocolate chips one way or the other. I suggested he take them to work. But he didn’t. Know how I know? I just found them stashed away in a ceramic pitcher in the kitchen! Definitely not a good enough hiding place! And that’s how I find myself stuffing chocolate chips into my mouth once again. Yes, I know there’s a name for this: stress-eating. But I don’t like to think of it that way. I prefer the term self-soothing. Remember when we were young parents, reading Brazelton and other parenting gurus’ take on “how to get your baby to self soothe” so you could all get a good night’s sleep? Well, that’s how I feel about over-indulging on chocolate the day I find out my bestie might have cancer (again). I self-soothe with some delicious chocolate so we can all get along better. 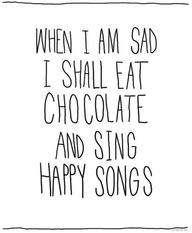 And besides, we all know that chocolate is actually kinda’ good for you. Read all about its health benefits here! Okay, so maybe eating half a bag in one (long) sitting is overdoing it, but at least there are redeeming qualities in my drug of choice! Should I feel bad? I think anytime we feel like we’ve lost control of ourselves, we feel defeated. Seen from that angle, I should probably stop eating them before the whole bag is gone and I feel utterly and completely awful about myself. But, on the other hand, maybe I have hit upon an easy and relatively inexpensive coping mechanism that works for me. A bag of chocolate chips eaten over several days is probably not the end of the world, is it?Well, as long as I don’t go out and buy another bag, I think I’ll be alright. Meanwhile, this post is taking longer than it should to write because I have to keep getting up to go get more chips. Real tip #1: Don’t buy chocolate chips until the hour before you plan to make something with them. NO EXCEPTIONS.